“As a young girl, I grew up in Virginia’s scenic and historical Shenandoah Valley. Attuned to the beauty and gifts of nature, I felt a sense of wonderment and peace to be in it. Drawing was essential in my youth, but it wasn’t until I attended art class in high school that I truly discovered my artistic expression. I was introduced to different mediums of painting as well as other forms of art. Embracing oil painting as my medium of choice, I enthusiastically learned all I could about painting through books that were available to me. As I began a more vigorous period of development exploring techniques, during the past decade, my focus on Impressionism aided me into the understanding of color theory and color harmony, in depth. I felt that this time spent to learn and research this style helped to broaden my focus and to raise my level of skills towards my traditional representational oil paintings. My work transitioned into developing a keener sense of atmosphere and time of day. Studies into the American Luminist Movement led me towards the passionate understanding of how I characterize nature with rich, warm tones accented by coolness to give depth and impact. Studying with books and learning marketing skills through art magazines were and still are my source for knowledge and training, as a self-taught painter. Initially, I was drawn towards painters like Albert Bierstadt, Thomas Moran, Frederick Church and then the Hudson River Painters. It was during that time that I came across the paintings of George Inness. His work evolved from a typical European style of painting towards sophisticated works that became the embodiment of his character, thought, design and beliefs. His landscapes brought my way of thinking about painting to a new level of meaning and reverence towards nature. 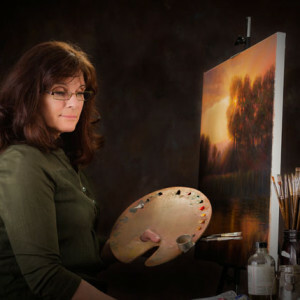 Award winning artist Michele Pope Melina grew up in the lush, beautiful landscape of Virginia's Shenandoah Valley. Born in 1951, Michele was inspired by nature and history at an early age. 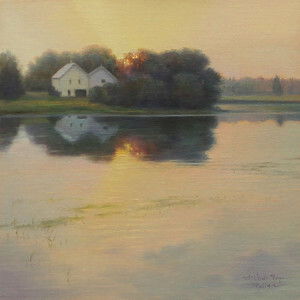 Michele's artistic influences include American landscape master George Inness, the Hudson River Painters, American Impressionism, and American Luminist Movement. Through vigorous self-training, Michele studied color theory and technique. Careful observations with experimentation led her to understand techniques of the Old Masters. Her paintings are exemplary of the style that evolved from this process, characterized by her use of Impressionistic colors to create a unique sense of drama and joy within her Traditional Representational oil paintings. Whether it's an intimate still life setting in the studio or a newly charted landscape from a road trip, the importance of knowing a subject fully is paramount to Michele. 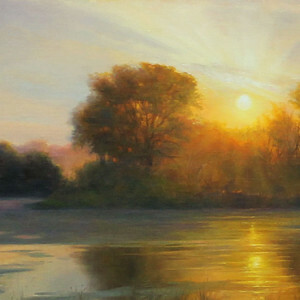 Much of the subjects she chooses to paint are scenes near her home of Hanover, Minnesota. These are places that are familiar and frequented. 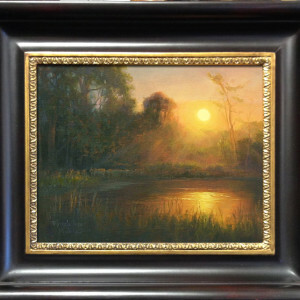 Attention to accuracy helps account for the awards that she has won and for her Signature Member status with the American Impressionist Society. At the peak of her 44-year career, Michele considers herself “always a student”. She continues to strive toward beauty and passionately dedicate herself to excellence.